Jinkee Pacquiao recently graced the cover of the January 2012 issue of MEGA Magazine looking absolutely beautiful in the photo. However, her photo received both positive and negative reactions. To some, the photo was photoshopped, making her more look like Kristine Hermosa, and not the real Jinkee Pacquiao. On my end, she has always been pretty, and even prettier now with all the wonders of science and thanks to Vicky Bello.. (lol). But Jinkee is not the only one with a controversial photo. 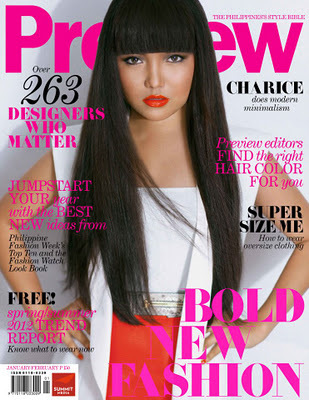 Singing sensation Charice Pempengco also graced the covers of the January 2012 issue of Preview Magazine. Charice looks very pretty in the photo. She's got bangs, lips pouting, and a somewhat "chinita"(chinese eyes). This photo too received negative reactions, and with all the accusations of photoshop.. blah blah.. blah.. It's your opinion. Do you think the photos were photoshopped or overly photoshopped for the magazines to sell?